On impulse, Quinn gives up her job, home, and boyfriend. She heads up the coast to the small hometown of Wildstone, California, which is just a few hours north, but feels worlds apart from Los Angeles. Though she doesn't quite fit in right away, she can't help but be drawn to the town’s simple pleasures… and the handsome, dark-haired stranger who offers friendship with no questions asked. Who could not fall in love with this story full of engaging and entertaining characters? Ms. Shalvis always gives us a whole book full of new friends to get to know and love, and this time we have the residents of Wildstone to amuse us, as well as meeting the important people in Quinn's life in LA. There are a number of layers running through the story, which offer plenty to keep one's interest and that tie back together and give the reader plenty of emotional connections to the main protagonists. Quinn learns the hard way just how much her parents may have had to put up with when she was a teenager. And she also recognises that whilst they may have kept secrets from her, they only ever wanted to be the best parents that they could be. Mick is caught up with helping his newly widowed mother, but cannot help but support other residents of the town who are being persecuted. Both of them have to make big decisions at a time when they are also dealing with an unexpectedly serious attraction. Each chapter starts with a lovely little statement, which introduces the likely issues being raised in the chapter. I really enjoyed seeing how its relevance played out. I am so happy that we will be visiting Wildstone again, as we need to know that Lena gets her man, and more about the town is going to have a resurgence in its fortunes. Quinn is going through the motions of life after having lost her sister in a car accident two years ago. Her life is so-so, nothing exciting or out of the ordinary, but she's just happy enough as a sous chef at an upscale restaurant. Until her world implodes when a phone call from a rural lawyer lets her in on a well-kept secret: Quinn was adopted as a baby. As she struggles to come to terms with the fact that her parents had lied to her all of her life, thinking she wasn't good enough to stay with woman who gave birth to her and not having her sister to talk her through it all, she has to come to terms with the biggest bombshell of all. She has a sister. A full sister. And in both instances, their father didn't want anything to do with his child. Facing an uncertain future, Quinn has to navigate how to relate to a teenager, run a business, and try to find time for love all the while grasping at the words of wisdom her ghostly sister brings her. 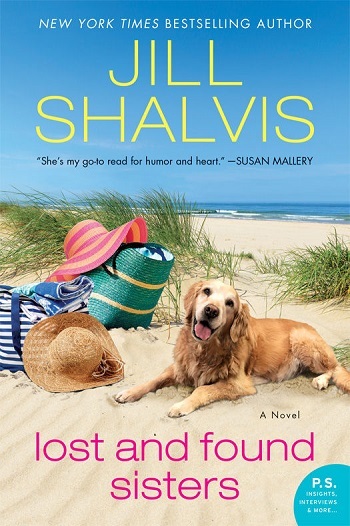 Reviewers on the Wicked Reads Review Team were provided a free copy of Lost and Found Sisters (Wildstone #1) by Jill Shalvis to read and review.